Wow, it's go time. After so much anticipation that really started building up as soon as The Force Awakens screened in 2015 or maybe as far back as when Disney confirmed a new trilogy of films upon acquiring Lucasfilm and all of its related properties. But it is anticipation that has been more than well-earned and now everything has come to a head. Star Wars: The Last Jedi is an interesting addition to the franchise that is very fresh in feel while still remaining quite familiar. It goes through familiar beats but it also surprises you in terms of how everything is put together in a new way. It's rathher different from the original trilogy but it also isn't entirely strange or alien either. 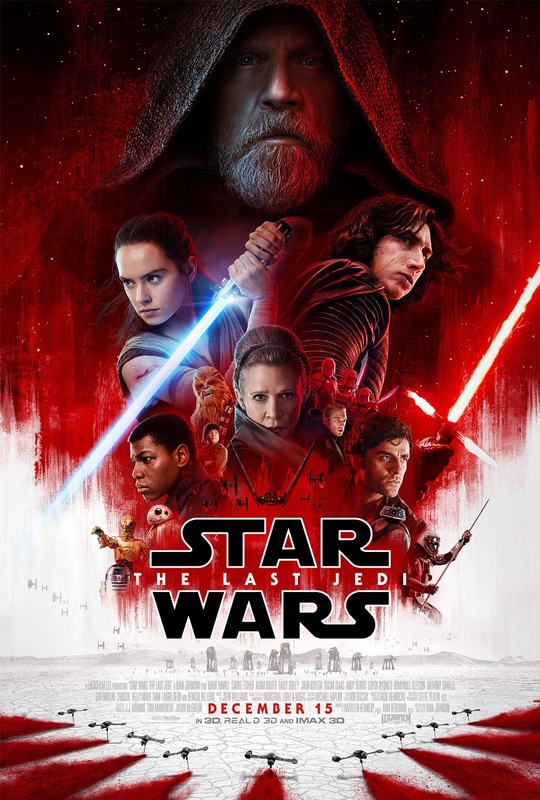 In other words, it's a GREAT movie that manages to balance the complex demands of supporting newer fans who only came on board with The Force Awakens while still giving longer term fans something to enjoy and quite a number of winks and nudges to more extreme levels for fans of the Legends and Expanded Universe stories. Synopsis: Star Wars: The Last Jedi is the second movie in the new Star Wars sequel trilogy but is the eigth movie overall in the core Star Wars movie storyline, not counting spin-offs like Rogue One. The movie was written and directed by Rian Johnson, the same man who gave us movies like Brick and Looper. The movie begins with The Resistance hastily evacuating their base just as a First Order fleet arrives. Commander Poe Dameron (Oscar Isaac) leads a risky and ultimately costly move to take out the First Order dreadnought despite General Leia Organa's (Carrie Fisher) orders to withdraw once the last of the transports had been loaded. But in a surprise move the fleet manages to accurately track the Resistance ships through hyperspace, making escape through hyperspace impossible. All they can do is to push their engines to maximum to keep pace with the First Order fleet just out of the effective range of their guns until their fuel runs out. Meanwhile Rey (Daisy Ridley) has found Luke Skywalker (Mark Hamil) on an island on Ahch-To. But Luke refuses to deal come with her even when she mentions that his sister Leia and all of The Resistance need his help. He seems determined to stay away from the greater conflicts and to some degree his own legacy as a Sywalker and wielder of the Force. But Rey isn't taking no for an answer. What I Liked: Wow where to begin? I was already singing praises to this movie in the introduction of this review. And it is great since it has a good story, strong characters, great action and an amazing end to things. Everything was quite thoughtfully put together and and the resulting movie really engages you as a viewer. I was really surprised by how much of a role General Leia Organa played in the movie given the death of Carrie Fisher. In cases like this you sort of expect them to give her maybe one good moment then politely set her aside. But no, she was front in center in many parts of the movie, albeit not as chatty as we'd want to be but still just as powerful a presence in the movie even just by staring meaningfully at another character or into the camera. Rey has an amazing arc in this movie, one that nicely builds on her journey from The Force Awakens. Daisy Ridley did a phenomenal job of conveying the complex emotions of her character and helped us all feel her struggle. And finally it was mentioned in some interviews that Rian Johnson spent 3 months with the Star Wars Story Group and I swear it really shows. There are parts of the movie that naturally bring in elements of the original trilogy (definitely a lot of Empire moments in this one for sure) in creative and clever ways. And I swear those crystal foxes are like one of the most Filoni-esque things I've ever seen in a Star Wars movie. What Could Have Been Better: The movie still has weird moments that could have been more meaningful but for now I don't quite see the longer term implications. Naturally there's a lot of mysticism with Rey that falls under this category particularly her experiences exploring certain parts of the island Luke Skywalker has banished himself to. They were visually impressive for sure but in the end it all feels like "what was that?" and thus become less important in the longer term. And that ties into another quirk of this movie - at times the visuals supercede everything else and I'm not full invested in the narrative he's tryin to sell. Just look at the planet of Crait, which was quirky and visually interesting with the whole red effect we see in most of the trailers and has also set the tone for the posters but a lot of it just feels odd. This is a really minor point and I get the goal he had in mind - it just feels like a bit too much or trying just a little too hard at times. TL;DR: Star Wars: The Last Jedi is a lot of fun and continues the great work that went into The Force Awakens and turned things up to eleven. It's a movie with a lot of moving parts and most end up going well and give you a fulfilling sense of resolution. Thus the movie gets a full 5 porgs shouting directly at the camera out of a possible 5.